The nominal voltage of a single LiPo cell is 3.7V, though the open circuit voltage of the cell is 4.2V when it is fully charged and at 3 Volts the cell is completely discharged, thus the safe operating zone of a Lithium Polymer battery is between 3V and 4.2V. Overcharging or over-discharging a Li-poly battery can result in damaging it and can even cause an accident, so you should be careful when charging and discharging these batteries. Have in mind that in order for these batteries to provide higher voltages manufacturers are combining multiple cells in one package. For example a single cell LiPo battery is labeled as 1S (1 cell in series) and is rated at 3.7V, two cell LiPo battery is labeled as 2S (2 cells in series) and is rated at 7.4V, three cell as 3S (3 cell in series) and 11.1V and so on. The capacity of a LiPo battery can vary based on the cell(s) being used for the specific product. A single-cell 1S LiPo battery can be as low as lets say 50 mAh in terms of capacity and that capacity can be increased to thousands, tens of thousands and even hundreds of Amps. Single LiPo cells can have a limit on their capacity usually in the range of few thousand miliamps, so if you are in a need of a higher capacity battery (regardless of the cell number) you can get a battery with multiple cells connected in parallel for increase in the current and not in series to increase the voltage. You can easily understand if you have multiple cells in parallel for a LiPo battery by looking for a rating of 1P, 2P, 3P etc, as this gives information if the battery has a single cell (1P) or more like two (2P) or three (3P) cells connected in parallel. So for example a battery labeled 14.8V 5000 mAh 4S2P should give you the information that this is a 4-cell LiPo battery and that each of the battery cells wired in series consists of two smaller 2500 mAh capacity cells wired in parallel to provide a combined 5000 mAh rating per cell. Going for multiple cells in parallel allows you to reach a higher capacity per cell in series for a LiPo battery on one side, but it also gives you a higher discharge rate capability, though this also may lower the reliability and reduce the total number of recharge cycles if the battery cells in parallel are not matched well together or the user is not handling the battery well. So in order to ensure the most problem free experience we would recommend to go for 1P batteries in capacities where you can find them and are not limited to only 2P or even higher configurations. Another important rating that you will usually see written on a LiPo battery is the maximum charge and discharge rates that it can provide. These are written in the form of a number and then the capital letter C after that, here the C letter stands for capacity in short. 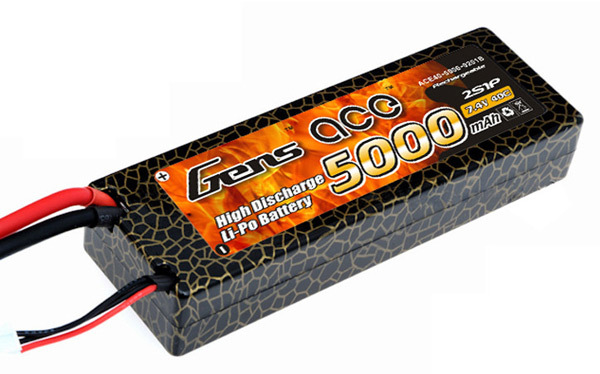 So a LiPo battery with a 1C charge rating should be charged at 1 times its capacity, so this means 5A charge rate for a 5000 mAh battery for example and it this way it should take roughly one hour to charge a fully discharged battery. There are batteries with charge ratings of 2C, 5C and some even higher allowing you to recharge them faster by providing higher charge current and thus reducing the charge time to half an hour or even less. Have in mind that it is recommended to normally charge batteries at 1C in order to get the maximum number of recharge cycles, even if they are rated to handle higher charge rates, charging at higher C rate may reduce their cycle life if not properly and carefully done. It is important to note that the recommended temperature range for charging batteries is in the range of 0ºC to +40ºC (though different battery manufacturers may vary this range a bit). It is very important that the battery is kept cool as when charging, especially with higher Amps rate it may start to get hot and overheating the battery while charging or discharging for that matter may lead to an incident such as the battery self-igniting and starting a fire. Aside from the charge rating measured in C (capacity) there is one more important rating of the battery that is measured using the capacity of the battery as a reference – the maximum discharge rate. LiPo batteries are capable of rapid discharges by providing current output multiple times their capacity. Usually the discharge ratings are two separated by a dash in the form of 20C-40C, though some batteries only have a single discharge rate printed on them. If the discharge rating is only one number this is the constant discharge at which the battery can operate in the case of 20C number it should be able to provide current output equal to 20 times its capacity. So for example a 5000 mAh battery with a 20C discharge rating should be able to function properly with a discharge current of 100A, though a at a constant load of 100A (20C for 5000 mAh battery) the battery should be able to do that for about 3 minutes until it reaches its cutoff voltage and or the battery is completely discharged. If there is a second number like 40C after the initial discharge rating this number shows the peak current discharge rate that in the above case would be 200A (40C for 5000 mAh battery). That second number represents the current load that the battery should be able to handle as a peak for a very brief moment, so if for a second you try to get 200A from that battery it will be able to handle it and not report a voltage below the safe zone at which the battery will be considered discharged even though it will not be. Just like with the charging of the LiPo batteries you should also be careful when you are discharging them. The safe zone in terms of operating temperature when discharging a Lithium Polymer battery is usually in the range of -20ºC to +60ºC. Have in mind that going below 0 degrees Celsius would lower the performance of the battery and the capacity it should be able to provide is going to be lower than at the optimum operating temperature of about 20-25ºC, so some manufacturers recommend 0ºC to +60ºC and not sub zero temperatures. As with most other batteries LiPos also perform slightly better at higher operating temperatures due to the lower internal resistance when the temperature is higher, however you should be very careful not to overheat the batteries, because as already mentioned this can damage the battery and cause an incident. Due to the fact that the discharge rates of LiPo batteries are usually a few times or even tens of times higher than their charge rates the overheating of batteries is more common issue when they are being discharged than charged. Pushing the battery to its limits is what usually can damage batteries making them puff and start a fire, now having a LiPo battery getting hot is not a problem, it normally happens when it is operating, the important thing is not to get out of the safe operating temperature. And while 60 degrees Celsius is usually the cited maximum, we would not recommend to actually get the battery hotter than 50, and if it gets hotter than you might be pushing it to its limits or the ratings of the battery may not be the actual ones. Either way we would recommend to either reduce the battery load or use a better battery that will handle the load with lower operating temperature in order to save yourself some potential problems. When talking about battery capacity and charge discharge ratings you should be well aware of the fact that some battery and/or cell manufacturers can overstate the actual ratings by as much as twice the real value and in rarer cases by even more. You should be especially careful with non-name Chinese manufacturers selling high capacity and high charge/discharge rate OEM cells or batteries at way too attractive prices, the chances in such cases is that the declared ratings may be overstated significantly. So as a good rule in such cases it is good to consider that the actual battery/cell capacity can be slightly lower and that the actual ratings for charge and discharge are in half what is being advertised, so you can be safe even when getting such batteries. If you are buying batteries from a brand that you know you can trust about the capacity and ratings then you should not worry much, but it would still be a good idea to have some extra headroom than you would actually need from the battery both in terms of capacity and rating. Of course what we’ll try to do here with out battery tests, especially for Lithium-based products such as Li-Ion, Li-poly and LiFe batteries is to try to verify if both the actual capacity and the charge/discharge ratings for different batteries as what they are claimed to be in order to help you in choosing the Right Battery for your needs.